If you’re like many automotive dealers, there’s a good chance your digital marketing decisions are guided by some form of matchback—and for good reason. Matching marketing tactics to vehicles sold has long served as a critical tool for evaluating the effectiveness of an overall marketing plan and making informed choices about budget allocation. But getting the most out of your attribution strategy by using every tactic at your disposal? That’s a little more complex. It’s true that many digital marketing services providers can match online ad views to vehicle registration records, enabling them to arrive at a general understanding of whether your ads are hitting the right targets. However, this one-dimensional approach doesn’t measure a number of key factors that can give you a far more complete and nuanced picture of how various elements of your campaign are performing. That’s why Search Optics is pioneering a more effective approach to attribution. 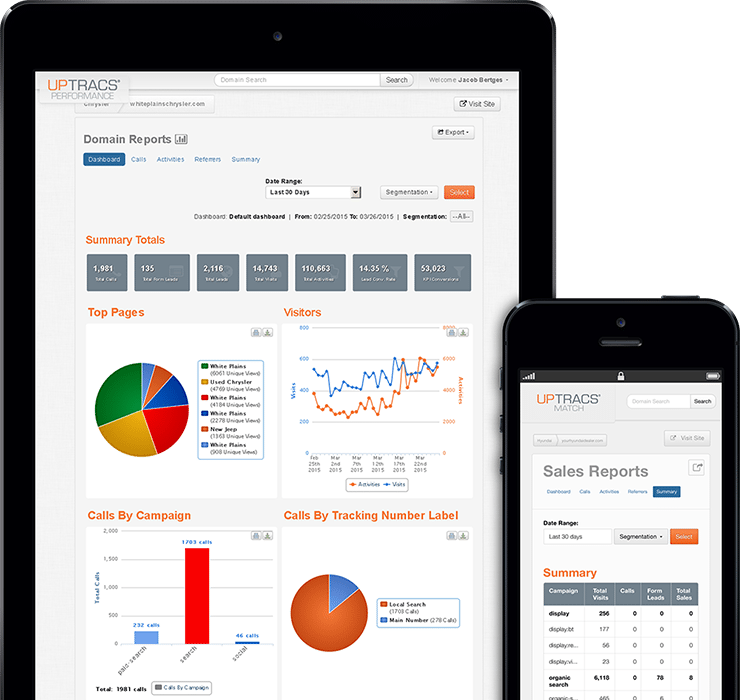 The dealers we work with have the opportunity to leverage UPTRACS, a digital metrics service on the cutting edge of marketing and measurement. It provides a single dashboard that enables you to track and compare the performance of various components of your campaign. Therefore, while traditional matchback ultimately entails some degree of uncertainty, UPTRACS enables us to deploy a comprehensive multi-channel attribution strategy that yields reliable data about which marketing tactics achieve the best ROI. For our clients, we use our best-in-class marketing technology and our own hands-on expertise to take into account offline conversion rates rather than simply tracking clicks or impressions. This approach enables us to deliver the best results for our clients by focusing on the wide range of information sources that influence buying decisions. That way, if a user doesn’t click on your pre-roll ad but eventually calls your dealership, for example, we’ll still be able to assess which communication channels generated the lead. Additionally, if you want a truly accurate picture of how your campaign is performing, measuring lift over control is key. We determine the sales activity of an audience exposed to a campaign and compare it to two benchmark groups—randomly selected users and in-market users—who did not see ads. Then, we figure out the rate at which these groups are purchasing vehicles (known as buy through rate or BTR), so you know exactly how your ads are influencing sales. •	After seeing our ads, shoppers were 84 percent more likely to buy a Ford compared to a random sample. •	For campaigns overall, BTR has improved 25 percent over the last five quarters. To learn more about how Search Optics and UPTRACS can help you optimize and measure your campaign, click here.